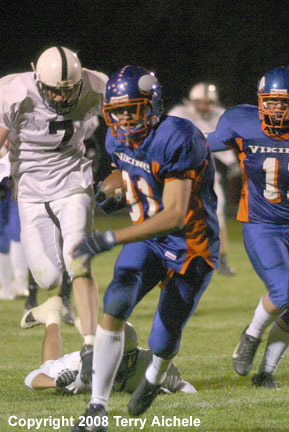 UMATILLA - The Umatilla Vikings celebrated homecoming with a win over the Vale Vikings on Friday night. The final score was 42-39 as both teams were able to move the ball and get into the endzone. Umatilla took possession of the ball after Vale ground to a halt and was forced to punt at about the ten minute minute mark of the first quarter. Umatilla started at the 41 yard line of Vale. The Vikings used their running game to make it to the Vale 16 yardline. There on 1st and 10 Umatilla's quarterback Steven Williams passed to Nathan Creason for a touchdown. The extra point was missed giving the Vikings a 6-0 lead. The Vale Vikings took the kickoff on their 35 yard line. 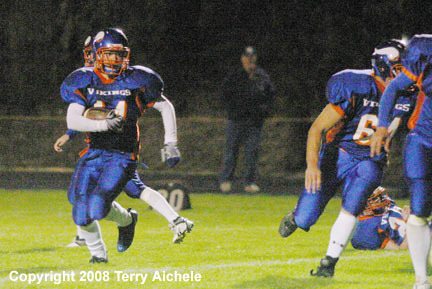 Vale used the running ability of Jeff Williams and Jarrod Tucker to move the ball to the Umatilla 20 yard line. Vale quarterback kyle Barras ran on a quarterback keeper going up the middle for a touchdown. The extra point was blocked. The score was tied 6-6 at 3:06 of the first quarter. Umatilla recovered a Vale fumble on Vale's 32 yard line in the closing seconds of the first quarter. Derek Baker of Umatilla made 15 yards on the first down. A series of hand offs brought Umatilla to the 4 yard line. Finally at 10:25 of the second quarter Nathaniel Ten Eyck scored on a 4 yard run. Umatilla missed the point after for a score of 12-6. Umatilla next took possession at 8:06 to go in the second quarter. Using a mix of runs and passes Umatilla made their way to the 9 yard line. At 2:26 on a second and goal Williams rolled to his right and completed a pass to Justin Vandever for a touchdown. The two point conversion was good to give Umatilla a 20-6 lead. The Vale Vikings took the kickoff and on a series of plays made it to the Umatilla 32 yard line. Vale scored on a 32 yard touchdown pass. They missed the two point conversion. Umatilla lead 20-12. With 44 seconds to go in the first half Umatilla took the kickoff to the 6 yard line. A holding call nullified what looked like a touchdown by Derek Baker. That sent Umatilla back to the Vale 15 yard line. A couple plays later, with just 17 seconds to go, Williams scored on a 9 yard quarterback keeper. The two point conversion was good to give Umatilla the 28-12 lead going into halftime. Halftime homecoming festivities can be seen by clicking here. Umatilla took the opening kickoff of the second half and was forced to punt. Vale took possession on the Umatilla 48 yard line. Using the shotgun formation Vale's quarterback Barras ran to the 10 yard line. Barras then passed to Matt Fulleton in the middle for a touchdown. The extra point was blocked. Umatilla led 28-18. Umatilla took the kickoff and stalled on their 33 yard line with a 4th and 15. Umatilla's punt team recovered the Vale punt receiver's fumble on the Vale 39 yard line. After a penalty and several plays that really didn't go anywhere the Vikings had a 2nd and 26 on the Vale 31 yard line. 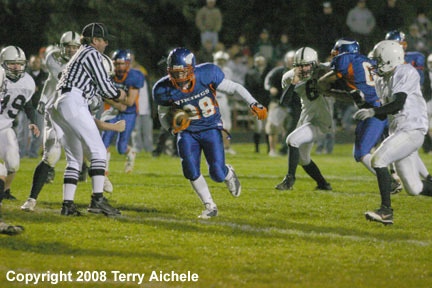 Going through an opening on the left side of the line Justin Vandever ran for a touchdown at 6:45. 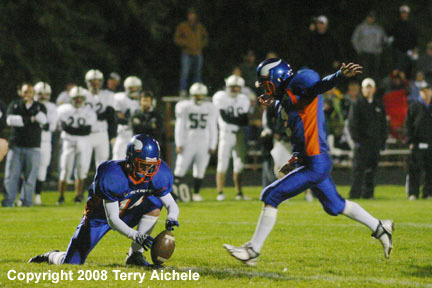 The extra point was good to give Umatilla the 35-18 lead. Vale took possession following the kickoff and using a mix of runs and passes including a pass for about 43 yards to Scott Browen for a first and goal. A motion penalty moved Vale back to the six yard line. Barras scored on a quarterback keeper. The extra point was missed to make the score 35-24 in favor of Umatilla. As the third quarter came to an end Umatilla was once again driving towards Vale's goal line. They ended up being stuck at 2nd and goal on the 4 yard line as the quarter ended. 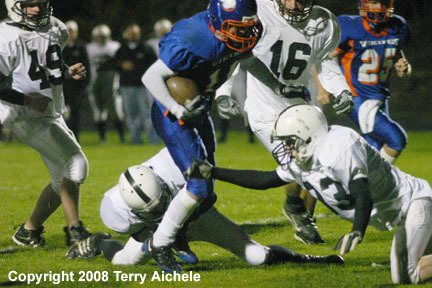 As the fourth quarter opened Umatilla took three tries at scoring a touchdown. Finally they send in the field goal team. The attempt was missed. Vale took the ball on their 20 yard line and out of the the shotgun formation used mostly passes to to move into Umatilla territory. Vale made it to 1st and 10 on the Umatilla 22 yard line. Barras completed a pass down the right side for a touchdown. The two point conversion was good. The score at the 7:32 point of the fourth quarter was Umatilla leading 35-32. Umatilla took the kick off to their 40 yard line. Four runs including a quarterback keeper set up Umatilla 3rd and 6 on the Vale 44 yard line. Williams then threw a pass to Lee Bursell for a touchdown with 4:23 to go in the game. The extra point was good giving Umatilla the 42-32 lead. But Vale wasn't done yet. 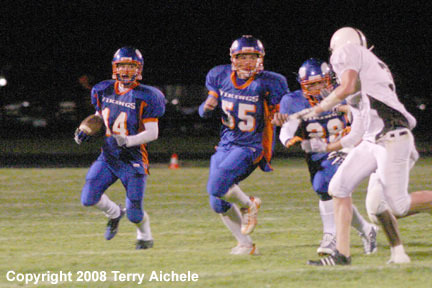 Vale went to the shotgun for a series of plays made up mostly of passes to get to the Umatilla 38 yard line. Barras then handed off to Jarrod Tucker who runs it to the 15 yard line. Again from the shotgun Barras threw a pass to Tucker for a touchdown. The extra point was good to the close the score to 42-39. Vale attempted an onside kick but it didn't go ten yards and was given to Umatilla. Umatilla drives to the Vale 11 yard line in a series of clock eating plays. Then a Umatilla runner fumbles the ball on the Vale 1 yard line with 10 seconds to play. With Barras standing in his endzone in the shotgun formation he takes the snap and begins running until he is nearly stopped and then laterals the ball to begin a hook and ladder play. Umatilla's defense finally stops Vale after the clock runs out. Final score has Umatilla winning 42-39. It's always good to win homecoming and the Vikings were able to. 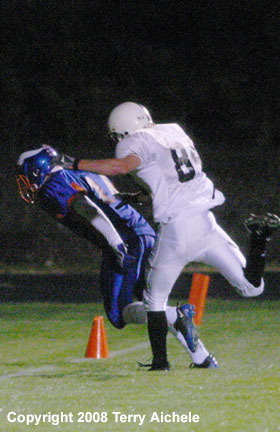 LEFT - A Umatilla player, in blue, battles to catch the ball with a Vale defender. RIGHT - Steven Williams attempting a point after. 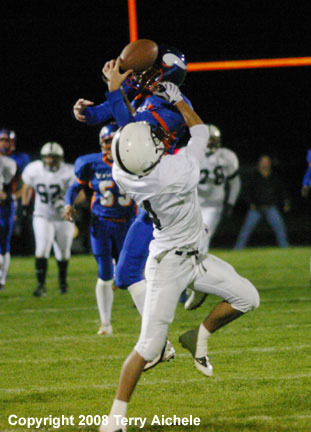 LEFT - Kasey Pankey of Umatilla catches a pass. RIGHT - Nathaniel Ten Eyck of Umatilla runs around the left end. 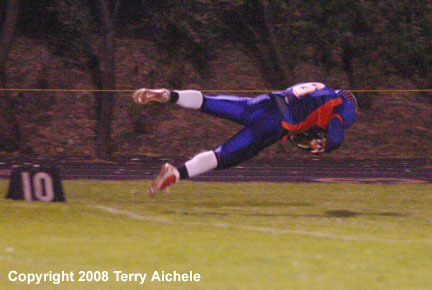 LEFT - Derek Baker of Umatilla pulls in a pass for touchdown in the back of the endzone. 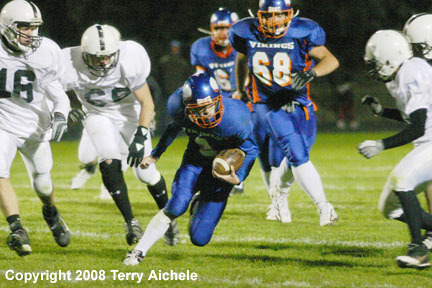 RIGHT - Aaron Trukositz of Umatilla carries the ball. LEFT - Justin Vandever of Umatilla appears to be trying to emulate a cruise missile during a run. RIGHT - Derek Baker of Umatilla carries the ball. 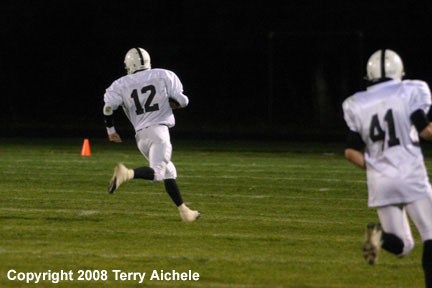 LEFT - Kyle Barra of Vale takes off for the endzone and a touchdown to close the score to 35-24. 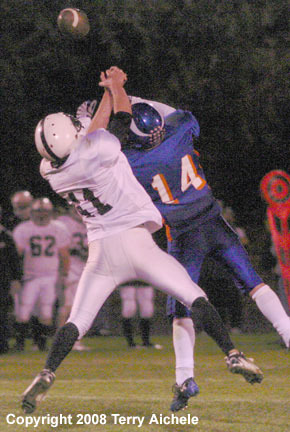 RIGHT - Dayce Cummings of Vale battles Derek Baker of Umatilla for the ball. 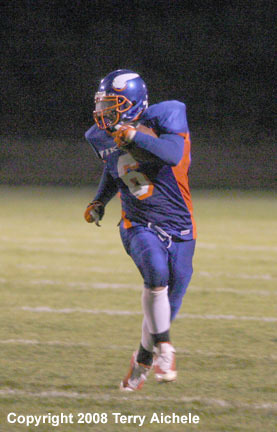 LEFT - Justin Vandever of Umatilla running with the ball. RIGHT - Umatilla's quarterback Steven Williams carring the ball. LEFT - Nathaniel Ten Eyck of Umatilla running in some open space. 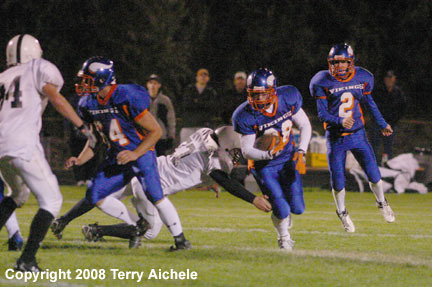 RIGHT - Derek Baker of Umatilla runs behind the blocking by teammates Austin Beiren and Nathaniel Ten Eyck.